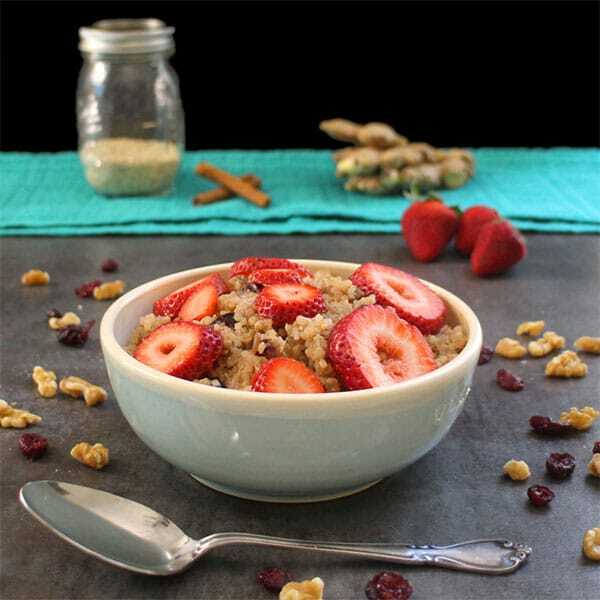 Quinoa Breakfast Bowl – It’s What’s for Breakfast! 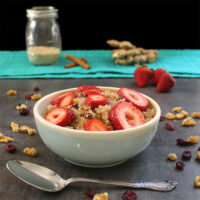 I am so into this sweet, quinoa porridge from my friend Dianne Wenz’s new e-cookbook, What’s for Breakfast?. Next time you make quinoa for supper, make a couple of extra cups, so you can make this Quinoa Breakfast Bowl in the morning! This is Dianne’s fourth e-book, and it’s packed with delicious, vegan recipes to start your day! Her other cookbooks are: What’s for Lunch?, What’s for Dinner?, and Summer Salads. 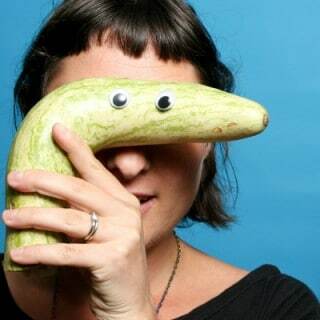 Dianne is a graphic designer as well as a recipe developer, and that really shows in her cookbooks. They are as gorgeous as the recipes inside are delicious! Scrambles – Check out the Mushroom-Leek Tofu Scramble from her book over on Fran Costigan’s site! This book has something for everyone, and the Fruit & Nut Quinoa Breakfast Bowl might just be my new favorite way to eat leftover quinoa! This Fruit & Nut Quinoa Breakfast Bowl is a healthy, satisfying way to start the day. Just simmer everything on the stove for a few minutes, and you're ready to eat! Top with a drizzle of maple syrup and the fresh fruit. Serve hot. Recipe excerpted with permission from What's for Breakfast? Morning Favorites from Dianne's Vegan Kitchen by Dianne Wenz. Note from Becky: I had the best results when I left the cover on the pan, checking in every few minutes to see how plump my dried fruit was getting. It took around 10 minutes, more or less, depending on what fruit I chose. That’s one hearty bowl! I love using quinoa in place of oatmeal. It really is. Quinoa is the best! Yum! I love quinoa breakfast bowls. I will definitely have to check out this book. It’s so good! I love how flexible most of the recipes are. 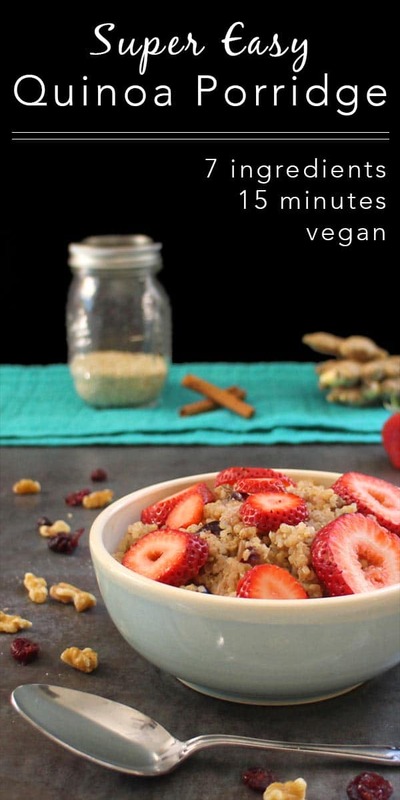 Yum, I always am thinking of ways to start the day off with some good grains so I’m totally trying this! Looks easy to do too! Ooh, this is such a fun spin on traditional oatmeal for breakfast! Love this recipe! What a delicious way to start the day! The photos look delicious. Luckily I have all the ingredients to try it! Thank you so much for sharing this recipe, Becky! I love the video you made! You are so welcome! I’m glad you enjoyed it.